Does Climate Change Skew Jobs Data? If you're among the tiny handful of Americans who wake up early on the first Friday of every month to load the website of the Bureau of Labor Statistics (BLS), you got a welcome surprise last Friday. The February jobs numbers showed an increase of 236,000, with big gains in sectors like construction and health care. This certainly could herald an improving job market, with strong growth that can rapidly bring down the unemployment rate. But experienced jobs-report watchers have noticed an odd trend over the past several years, one that could temper optimism over the positive indicators for February. Since the start of the recovery in early 2010, the BLS reports have shown solid growth numbers in the winter and early spring, followed by a slowdown later in the year. A look at the monthly numbers reveals the pattern. 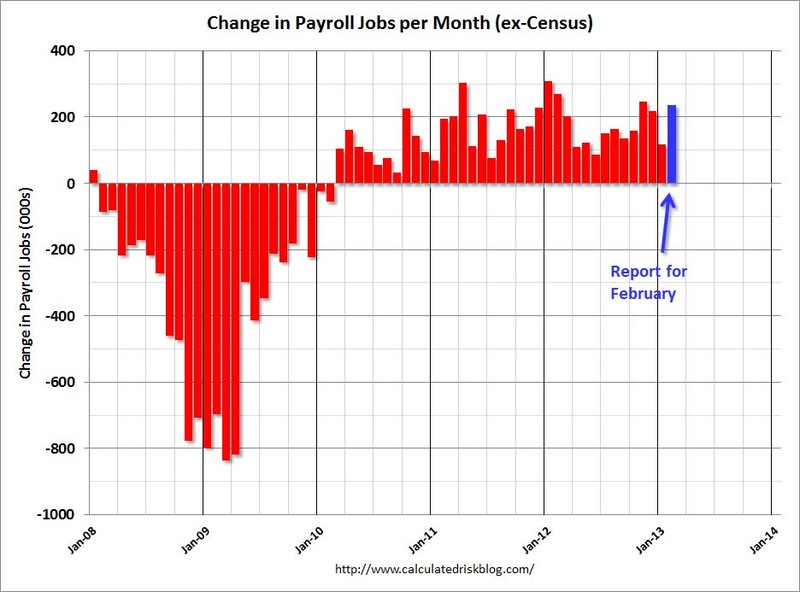 Last year, the two months with the highest increases came in January (311,000 jobs) and February (271,000). In 2011, the February and March numbers were high, cresting in April (304,000) before coming back down to earth. The February 2013 numbers follow a similar trajectory. Of the five highest recorded monthly jobs numbers since 2010, three of them fall in a January or February, with the others in November 2012 and April 2011. Economists like Jared Bernstein of the Center on Budget and Policy Priorities have taken notice of this trend, calling it an "anomalous up-and-down cycle." This isn't supposed to happen. In fact, the BLS tries hard to account for seasonal factors. The jobs numbers you see every month do not actually reflect the raw amount of hiring and firing in the economy, which is quite volatile for a number of reasons (more on them in a moment). The BLS employs a "seasonal adjustment" mechanism to smooth out these factors, and provide a better representation of the underlying macroeconomic trends. This helps policymakers understand what’s really happening in the economy, so they can set policies accordingly. As the BLS indicates on its website, "accurate seasonal adjustment is an important component in the usefulness of these monthly data." But what if the BLS' seasonal adjustment isn't working as well anymore, and the resulting numbers consistently show relatively good winters for jobs, and subsequently more tepid summers? There's one explanation for why this may be happening that could surprise you: climate change. There are plenty of good reasons to explain why job growth follows a seasonal pattern. Retail stores hire hundreds of thousands of short-term employees in November and December to deal with the holiday shopping rush, and fire them in January. Public schools hire at the start of the school year and let workers go in the summer. And the weather plays a role in hiring, according to economists; outdoor jobs often shut down in colder weather, consumers feel less inspired to go out in the cold and spend money, and people often cannot even get to work. This "hibernation" time for the economy leads to employers handing out relatively fewer shifts in the winter months. But anyone who has stepped outside this winter knows that it's been fairly mild. This means that outdoor construction jobs don't get shut down. And consumers can shop without braving hazardous road conditions and chilly temperatures. Some economists argue that milder winters "pull forward" hiring that would have otherwise taken place later in the year. This is particularly true in the construction sector; projects that would normally start up in the spring can get a jump if the weather complies. Sure enough, the February 2013 numbers showed 48,000 new jobs in construction, which fits with this trend. Looking at the same dynamic in 2012, the forecasters at Macroeconomic Advisers estimated that the warmer winter inflated employment numbers by 72,000 jobs that February. Climate scientists have spent years warning of changes in the seasons due to anthropogenic climate change. It may no longer be accurate to refer to higher temperatures in January and February as indicative of an "unusually mild" winter. This is gradually becoming the new normal, with implications for agriculture and marine biology and a whole host of environmental issues. The seasonal adjustment is supposed to keep up with the fact that "unusually mild" winters are no longer unusual. But it takes time, because of the way that the seasonal adjustment gets calculated. Economist Dean Baker of the Center for Economic and Policy Research explains that the seasonal adjustment is derived from the average of the past deviations of the raw jobs numbers in the specific month from the year-round average. "So if employment in February is ordinarily 1 percent lower than the year-round average," Baker says, "then the seasonally adjusted number for February would be 1 percent above its actual number." In general, the way the BLS derives the deviation is by looking at an average over the past 12 years, giving a bit more weight to more recent years. That means that BLS uses past performance to some degree to inform its seasonal adjustment algorithm. And if we’re seeing rapid shifts in climate—a study published last week asserts that the planet is warming at a faster rate than the previous 11,500 years—the past may no longer be a good indicator of the future. “If we are on a path with a permanently warmer winter,” Dean Baker says, "then the seasonal adjustment will be in accordance with what a mild winter looks like, not an old-fashioned severe winter. But it will take time to get there." The BLS' constant refinement of their seasonal adjustment mechanism means that they should pick up on these shifts faster. Recently, the agency switched to a standard of re-estimating their seasonal adjustment on a month-to-month basis. This "concurrent seasonal adjustment" means that BLS should be capturing any changes to seasonal patterns for hiring, with the older data gradually filtering out. CBPP's Jared Bernstein actually took matters into his own hands. "I have my own seasonal adjustment software," he noted, "and I ran the jobs data through to see if I could find a seasonal factor." Bernstein found the results inconclusive, and combined with the BLS' switch to concurrent seasonal adjustment, he was content to say that no smoking gun exists for the hypothesis of BLS missing the new trend. He held out the possibility that BLS could be playing catch-up, however, as the new normal of mild winters progressed. And regardless of how well BLS is coping, we're still left with this anomaly of consistently better winters for reported job growth than summers. "Typically, labor market recoveries are far less volatile month-to-month," Bernstein said. If the seasonal adjustment isn't filtering for our new climate reality fast enough, it does have implications for policymakers. The Federal Reserve looks at monthly jobs data to set monetary policy. "If we had a functional Congress, it would affect fiscal policy as well," Bernstein noted archly. The widely publicized jobs numbers can also affect consumer confidence in the economy. If the real macroeconomic trends are much smoother, without consistently good economic winters and bad economic summers, this could lessen anxiety and prevent rash policy decisions based on somewhat inaccurate data. There is evidence to suggest that the seasonal adjustment model isn't busted, and that the summer months have simply coincided with bad economic news the past few years. For example, the 2011 debt limit debacle occurred throughout the summer, with negative consequences for the economy. And as the effects of sequestration ripple out in April and beyond, we could see another set of weaker summer jobs reports this year. But if climate change is contributing to the flow of the economy, and the seasonal adjustment algorithm hasn't yet caught up to that, it's just another example of how a warming planet is changing our world faster than anyone in positions of power can react. That's perhaps the saddest conclusion anyone has ever drawn from a BLS spreadsheet.